We are at the shoreline of Lake Superior, ½ acre of land with 200 ft of shoreline. There are steps to the ledge rock below where you can listen and watch the waves and catch the lake breezes. The changing nature of the lake will grab your attention and sometimes create a sense of awe. Since the property is on the shipping lanes leading to Duluth, you will see the huge boats of the lake, and also the fishing boats of the local restaurants. 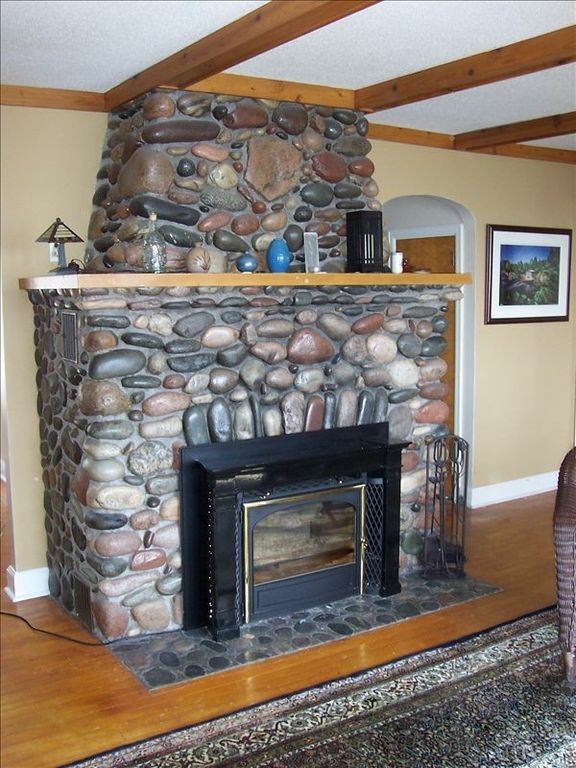 The home has beautiful views of Lake Superior, the family room revealing a sun drenched panoramic view. Nature is on display through the various views of other rooms. A screened-in-porch, lakeside deck, outdoor seating, and patio dining enhance the outdoor experience. A screened in gazebo also offers solitude and refuge from everyday stress. The main floor has two large bedrooms with comfortable mattresses and a sofa sleeper with view of fireplace and lake (sleeping for six people). The family room is adjacent to the kitchen and porch. There is also a dining room, piano, living room with original stone fireplace, and a TV room with leather couch, chair and ottoman, and views of the lake. For those who want to cook, the kitchen is fully furnished with cooking utensils and a electric stove and full sized refrigerator. An additional option is available to sleep another 2 guests, the Nor Hus, our name for the overflow upstairs studio unit. The Nor Hus can be rented in conjunction with the main level except for 8 weeks/year. During 2017 a long term renter for the Nor Hus, a retiree will be on site from July 6th to August 31st . The Nor Hus provides an additional bed (full sized), kitchenette, small bath, large TV, lovely 2nd floor views of the lake, and a deck. The two cities of Duluth and Two Harbors are within a 15 minute ride. Both cities offer festivals, shopping, and yearly events. Knife River is only 2 miles away and is the site of a large sandy beach, a marina, the Knife River, and the Superior hiking trail. Local smoked lake trout is available for you to buy, and fishing/boating excursions are for hire at the Knife River marina. For those who want to dine out, there are fine restaurants in the immediate area, and other dining choices from the familiar to the unique. Once you are here, you will wish you never had to leave. The charms of the North Shore are various and within a day’s drive from The Bon Aire at Greenwood Cliffs. As often as you visit, there is always more to explore. The natural beauty and rugged history are part of the experience. Keywords: lower floor of home: see review Jan 8, 2011, renter may be on site. My husband and I live in a condo in the heart of the Twin Cities. The Bon Aire is our spiritual refuge away from the noise and crowding of city life. I wasn't looking for a vacation home, but I ran across it online and fell in love with it. Some day we will retire to the Bon Aire. There is nothing else like the North Shore and Lake Superior. The home is larger than most would predict with almost 1700 sq ft. This allows for privacy and room to spread out. A new remodel upstairs opens this area to downstairs renters for an additional fee. Watch the large ore boats from Duluth harbor and small fishing vessels. Fully stocked for cooking. Has a sun room with table for eating with 3 large windows looking out at Lake Superior. This room leads to a 3 season porch with views of the lake. This is a room separate from the kitchen. Outdoor Fire Pit, Gardens, Sight of Duluth's Incoming/Outgoing Ships, large deck lakeside, lawn and gardens. Great location, right on the shoreline. My family enjoyed exploring the shores edge, and listening to the waves crash against the shore. Hoping we'll make it back here again in warmer weather for even more fun! So many detailed touches; perfect amount of space for separation & crafting or binge watching shows; great kitchen with everything you need; luxurious bathroom. The water and weather outside the windows is endlessly fascinating. This visit, we looked down at the frozen lake before bed, and saw a wolf loping up the moonlit ice just along the shoreline! Wow! Thank you for this place. We had a wonderful get away next to the quiet big lake. Don’t miss the sunrises, uniquely beautiful in the winter. The Bon Aire was perfect, beautifully decorated, with breath taking views from all of the common living areas of the home. The fireplace was cozy. We hope to return. So comfortable. So close to the lake. Thoughtful attention to all guest needs. The garage is not usually part of the rental. But it was below zero temps here this weekend and Chris called upon our arrival and offered the garage code for our car. So kind. Can’t wait to return and experience all the seasons here. Everything wa clean and cozy. Watch sun rises and sun sets. Rates are subject to the number of people renting. Rates are higher for Grandma's Weekend and holidays such as Thanksgiving, Christmas and New Years. If the dates selected are significantly in the future, I can adjust to a 3 payment schedule. **NEW* Studio upstairs is available to rent in addition to the downstairs for a rental fee of $50/nt and a cleaning fee of $25. Please discuss with Chris.